Hold a torch in your hand while in the dark to prevent the gloom. Wooden and stone tools degrade very quickly. Iron lasts a LOT longer! 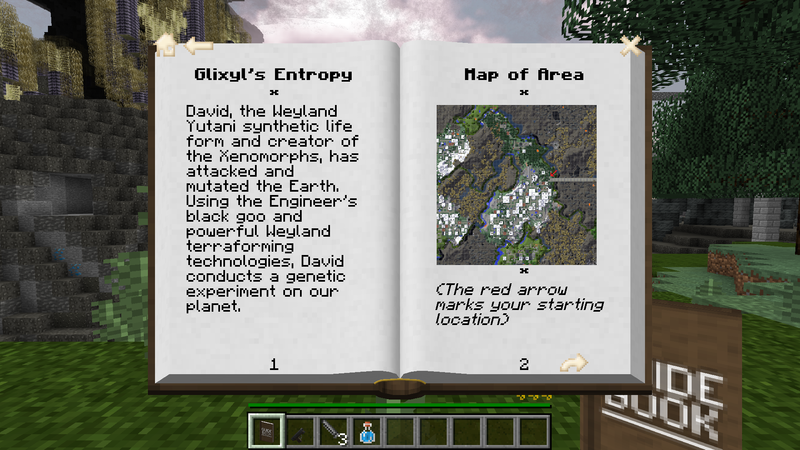 You can visit Glixyl.org for the Entropy Wiki for survival tricks and tips! Water from rivers and ponds should be boiled before drinking, or use a charcoal filter. The synthetic lifeform David has twisted the Earth with Weyland terraforming technologies. Rubber trees are extinct. Rubber resin is extracted from from Propolis using a centrifuge. Buildings that are occupied must be cleared of their hostile inhabitants before chests open. The deeper you are mining underground, the denser and more resistant the materials become. Pools of black goo litter the surface of the strange alien biomes. Avoid touching! Goo mutants roam the lands and are common along rivers. Their touch is highly toxic! The minerals monazite, cobalt, and lithium can only be found in alien biomes. You must bait your wooden fishing rod before use, otherwise you may only catch old boots. The Entropy update will break old worlds. To play MC1.7.10 maps, revert to ver 210 in launcher. Human raiders will try to loot and burn down your base. Make sure its fireproof and secure. The Assembler is difficult to construct, but will allow you to fabricate advanced AVP items. A water wheel is a great way to develop an early game power source. Just needs flowing water. If you want to play on a random map instead, just remove the seed from the default world options. Predators (Yuatja) sometimes drop electronic components and their advanced weapons upon dying. Most trees will fall over when you chop their bottom block. Alien trees behave differently. Most bee hives will protect themselves and attack the player when getting too close. Piranha stalk the rivers and oceans and are known to attack boats. Most guns, armor, and ammo must be scavenged from buildings/monsters. AVP guns/ammo are crafted.